"Pair of Candlesticks. Gilt brass. Circular base with moulded edge; engraved 'Christi Crux Est Mea Lux.' 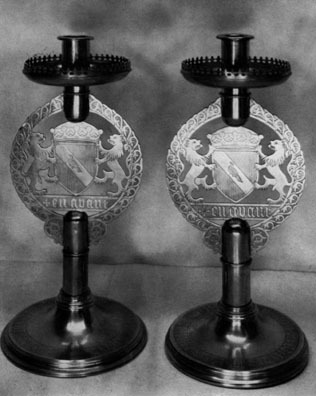 Annulated tubular stem broken by a flat pierced roundel engraved with foliated ornament and enclosing Pugin's arms and motto, En Avant. Circular drip-pan with fleur-de-lis cresting. Plain nozzle with moulded edge." Bury, Shirley. "Pugin's Marriage Jewellery." Victoria and Albert Museum Yearbook 1 (1970): 85-96. Victorian and Edwardian Decorative Art: The Handley-Read Collection. Ed. Simon Jarvis. London: Royal Academy, 1972. Nos. B112-13.